Wheat-free does not mean that you have to do without pizza, muffins, or cookies. The Wheat Belly Cookbook shows the reader how to recreate delicious wheat-free dishes using only healthy ingredients, including no gluten-free junk carbohydrate ingredients - so that you can enjoy a few slices of sausage pizza, chocolate chip cookies, or mocha walnut brownies without health consequences or guilt. And as studies have shown that cutting out wheat can help you to shed the pounds - without having to calorie count or exercise - you can even continue to eat your favourite foods whilst losing weight! "I can't recommend this terrific book highly enough. 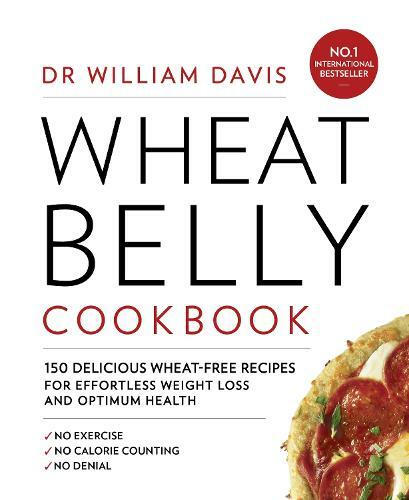 Wheat Belly... is a must-have for the library of any serious low-carber or anyone concerned about health." - Michael R. Eades, MD, coauthor with Mary Dan Eades, MD, of the New York Times bestseller Protein Power.